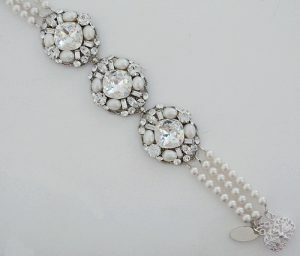 Three crystal brooches with freshwater pearl accents on a three strand bracelet ofSwarovski white pearls. Each brooch is 1 1/8 x 7/8″. Bracelet has a filigree tongue clasp, andmeasures 7″ in length. Designed by Haute Bride.